I recently ran a workshop for Sarah Salway’s team at Sheffield Hallam University on embedding ethnicity evidence in Joint Strategic Needs Assessments. This is part of a piece of work they are responsible for on Evidence and Ethnicity in Commissioning. While preparing for the workshop it struck me that with any new initiative we tend to focus on the present and the future rather than considering how this relates to what we did in the past. At times of transition I think it is important to understand our past context so that we can change our behaviours, cultures and expectations to fit the new environment. I have put together the ‘handy table’ below that tries to capture this – let me know if I should add more – or if you disagree with it! ← Friends or Enemies? 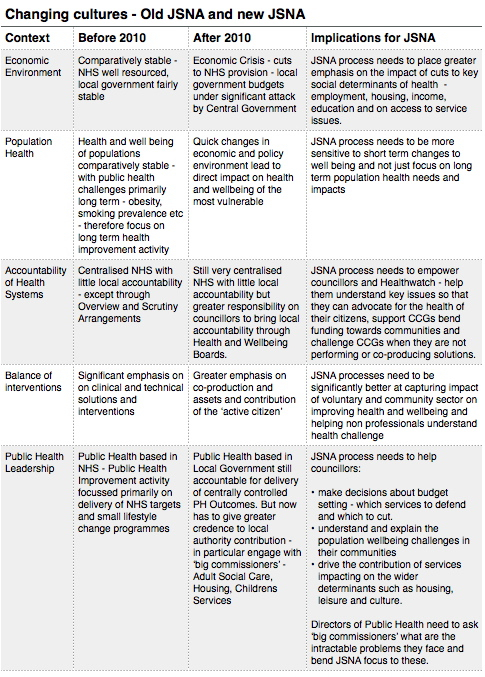 What have Councillors, GPs and Directors of Public Health got in common? Mark, this is really useful. I believe the last paragraph of your table is particularly significant – the new JSNA should reflect a much greater level of input from local authority officers and members. So perhaps a greater focus on whole communities (e.g. neighbourhoods) rather than target groups (e.g. smokers). This should lead to Joint Health and Wellbeing strategies which place much greater weight on broader-based solutions – physical activity, planning, transport, housing – where local authorities can have responsibility, expertise and resources. Good point – I think some places – for example Sheffield and Leeds are already doing this – bringing a greater neighbourhood focus to their JSNA work.